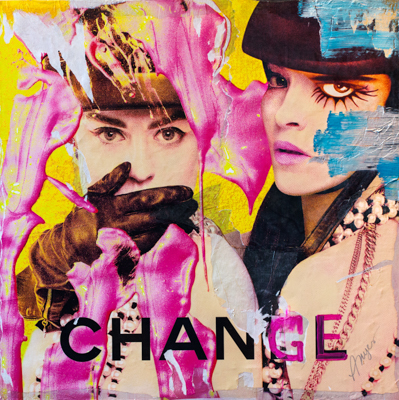 Anyes Galleani's art explores pop culture, reflecting a multitude of influences, from fashion to street art. Most recently Anyes has been collaborating with an emerging writer to create a new body of mixed media artwork and collage and, as a creative duo, they go by the name of VERO VONN. 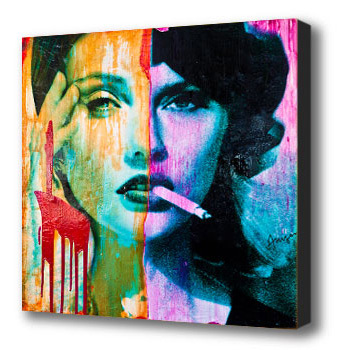 VERO VONN art will be available from Anyes Galleani's Gallery in the Arts District starting on May 5th 2019. 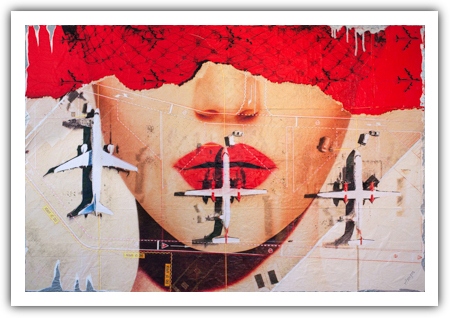 Anyes creates original art by collaging parchment, silk and paper prints of her digital images on wood panels. During the collage process Anyes deconstructs the prints and modifies the images to various degrees, adding textures, paint and text. This process makes each piece a one-of-a-kind artwork. The inspiration for this technique came from worn-out street posters and graffiti. Each piece is signed, photographed, catalogued and comes with a certificate of authenticity. Original paintings and prints can be purchased from this website or from Anyes' Studio Gallery in the Los Angeles Arts District. All artwork can be shipped internationally. If you have questions about our shipping & return policies, please visit this page or contact the artist. Anyes accepts commissions to create custom art, for more details click here. Most prints are sold in limited editions which vary depending on the images. Click on the "buy" button under the image to see the substrates and sizes available. 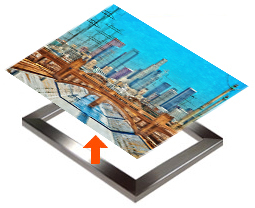 Metal prints are printed on aluminum, using a dye sublimation process. They come with a glossy finish, however a matte finish is also available. The wall mount consists of an aluminum box cleat inset about 3 inches from the image edge, which makes it easy to hang the art and keeps it floating 3/4"off the wall. Canvas prints are printed on a museum-grade matte canvas, which is a performance leader in color range and permanence. The canvas is wrapped around 1.5” thick, heavy duty stretcher bars and the sides of the canvas are black. You can request framing or gallery wrap, if the image allows for it. Prints arrive fully stretched and ready to hang. Paper prints are printed on archival smooth fine art paper, a luxuriously smooth surface ideally suited for color reproduction. Listed size is the finished image, we also add a white 1" border. Prints ship rolled in a tube. Additional substrates and custom sizes are available upon request, for more information please contact the artist. GIFT ITEMS including t-shirts, bags and pillows, featuring a selection of Anyes' artwork can be found on Anyes' Red Bubble shop, where you can also make purchases from outside the US using your local currency.